The international bestseller--now with a new preface by author John Kotter. Millions worldwide have read and embraced John Kotter's ideas on change management and leadership. From the ill-fated dot-com bubble to unprecedented M&A activity to scandal, greed, and ultimately, recession--we've learned that widespread and difficult change is no longer the exception. It's the rule. Now with a new preface, this refreshed edition of the global bestseller Leading Change is more relevant than ever. 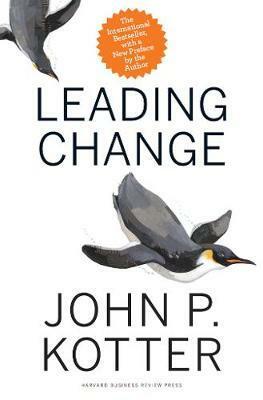 John Kotter's now-legendary eight-step process for managing change with positive results has become the foundation for leaders and organizations across the globe. By outlining the process every organization must go through to achieve its goals, and by identifying where and how even top performers derail during the change process, Kotter provides a practical resource for leaders and managers charged with making change initiatives work. Leading Change is widely recognized as his seminal work and is an important precursor to his newer ideas on acceleration published in Harvard Business Review. Needed more today than at any time in the past, this bestselling business book serves as both visionary guide and practical toolkit on how to approach the difficult yet crucial work of leading change in any type of organization. Reading this highly personal book is like spending a day with the world's foremost expert on business leadership. You're sure to walk away inspired--and armed with the tools you need to inspire others. Published by Harvard Business Review Press. John P. Kotter is internationally regarded as the foremost authority on the topics of leadership and change. His is the premier voice on how the best organizations achieve successful transformations. Kotter is the Konosuke Matsushita Professor of Leadership, Emeritus, at Harvard Business School and is cofounder of Kotter International, a leadership organization that helps Global 5000 company leaders accelerate the implementation of their most critical strategies and lead change in a complex, fast-moving business environment. John Kotter has authored eighteen books, twelve of them bestsellers. His works have been printed in over 150 foreign language editions.